Broadway musicals and drama come to Cape Cod at the Playhouse in Dennis. 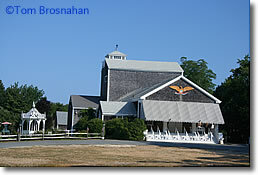 The Cape Playhouse - Cape Cod Center for the Arts on MA 6A in Dennis (map), is the place to go on the Cape if you want to see a famous actor or actress in a well-known play. The plays (and actors) usually change every week, so call to see what's current. The performance season runs from early July through Labor Day, with performances on Monday to Saturday evenings, plus mid-afternoon ("matinee") performances on Wednesday and Thursday. The playhouse has its own restaurant, open for lunch on matinee days, for dinner Monday through Saturday, for Sunday brunch, and for after-theater snacks. Also here is the Cape Cinema, designed after the Congregational church in Centerville. The cinema shows first-run movies and boasts a mammoth, 6,400-square-foot mural of the heavens by Rockwell Kent.